Over 18 Palestinians were kidnapped by the Israeli occupation forces (IOF) at predawn time on Thursday in mass abduction sweeps rocking the occupied West Bank and Occupied Jerusalem. The IOF rolled into Nablus and showered the city’s southern corners with sound bombs. Eyewitnesses said over seven army jeeps stormed Irak Burin town, to the south of Nablus, at the crack of dawn and sealed off the access road to the nearby Jabal al-Tur area. Several Palestinians were kidnapped following the assault. Others were kidnapped from the occupied West Bank provinces of Tulkarem, Ramallah, Bethlehem, and al-Khalil. The campaign culminated in the abduction of four Palestinians from Occupied Jerusalem city. Israeli Occupation Forces (IOF) on Thursday arrested 12 Palestinians from Occupied Jerusalem including a photographer journalist within an arrest campaign launched since the dawn hours. The IOF started the campaign in coincidence with its declaration of the formation of a new unit specialized in detaining Palestinians in the holy city. Most of the arrested were young men aged 16 to 23 years old. Some of them were ex-detainees in Israeli jails. Palestinian Prisoner Society revealed that Israeli forces arrested journalist Iyad al-Tawil, 27 years old, right from his home in Occupied Jerusalem. He works as a cameraman to al-Jazeera.net. The number of journalists detained in Israeli jails reached 22. Some of them were charged with incitement on social networking sites and others were held under the illegal administrative detention based on no charges or trials. Israeli soldiers have kidnapped, late at night and earlier on Thursday, at least fourteen Palestinians in different parts of the occupied West Bank, especially in the districts of Hebron and Jerusalem. 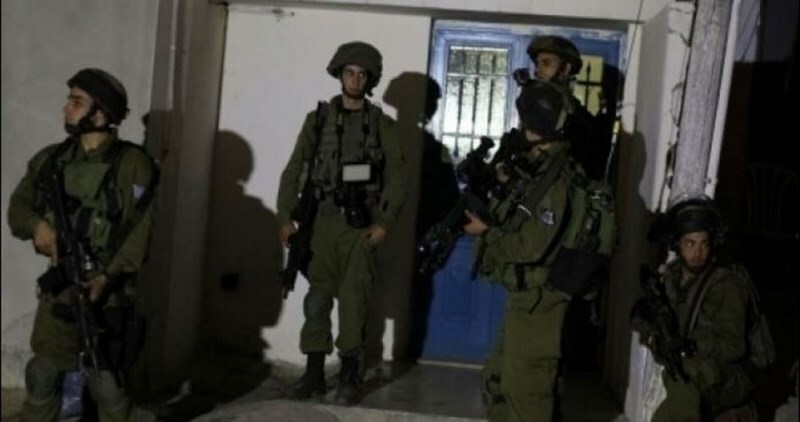 The Hebron office of the Palestinian Prisoners Society (PPS) has reported that the soldiers invaded many homes in the district, in the southern part of the occupied West Bank, and kidnapped five Palestinians. The kidnapped, largely from Yatta town, have been identified as Odai Masalma, Mohammad Manasra, Yazan Mohammad Zein, Mahmoud Jaber Zein, and Zein Makhamra. 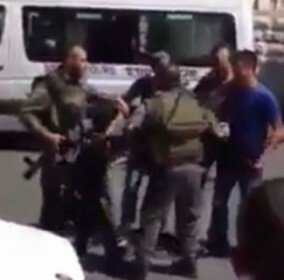 In Jerusalem, the soldiers also invaded and searched homes, and kidnapped four Palestinians, identified as Obeida ‘Ameera, Rami Fakhouri, Ahmad ar-Razem, and a child identified as Yousef Shaweesh. In Bethlehem, the soldiers kidnapped two Palestinians, identified as Mahmoud Da’amsa and Mohammad Omar Salah. 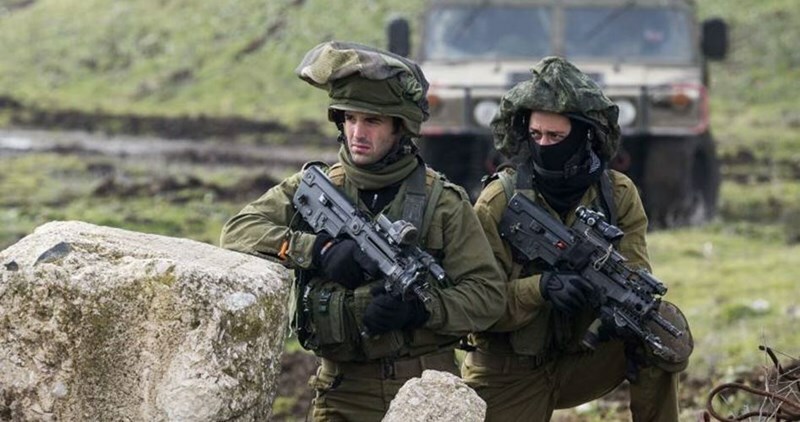 In the northern West Bank district of Tulkarem, the soldiers kidnapped two Palestinians, identified as Ammar Bassam Majdouba, 30, and ‘Eqab Jamal Zabadi, 24. In addition, a Palestinian, identified as Mahmoud Rasem Ekhzaymiyya, 25, from Qabatia town, south of the northern West Bank city of Jenin, was kidnapped in Jerusalem. Israeli soldiers invaded, on Thursday at dawn, the West Bank city of Bethlehem, searched homes and kidnapped one Palestinian from his home. The army also invaded Deheishe refugee camp, south of the city and kidnapped another Palestinian, while a third was kidnapped in al-Khader town. One Palestinian was kidnapped near Qalqilia, in the northern part of the West Bank. Media sources in Bethlehem city said several Israeli army vehicles invaded it, and kidnapped Abdul-Basset Mohammad Shahin, after storming his home and searching it, in the al-Karkafa area. The soldiers also invaded Deheishe refugee camp, and clashed with dozens of local youths who hurled stones and empty bottles at the military vehicles, while the army fired gas bombs and concussion grenades. In addition, the soldiers stormed and searched several homes in the refugee camp, and kidnapped one Palestinian whose identity remained unknown until the time of this report. They also summoned another Palestinian, identified as Khaled Ziyada for interrogation in the Etzion military base, south of Bethlehem. 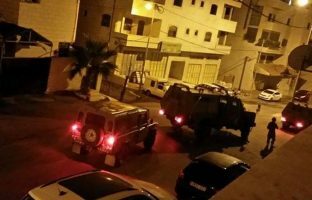 Also in Bethlehem, the soldiers invaded the al-Khader town, south of the city, and kidnapped a young man, identified as Mohammad Omar Salah, after storming his home and searching it. In addition, several army vehicles invaded Azzoun town, east of the northern West Bank city of Qalqilia, searched homes and kidnapped one Palestinian, identified as Wael Nasser Sweidan. Palestinian prisoners affiliated with the Popular Front for the Liberation of Palestine (PFLP) announced a ten-day suspension of their mass hunger strike Wednesday, according to a statement released by the Prisoners and Former Prisoner’s Affairs Ministry in the Gaza Strip. Dozens of PFLP-affiliated prisoners held in Israeli prisons launched a mass hunger strike last week in solidarity with Palestinian prisoner Bilal Kayed, who had started his hunger strike a few days earlier when Israeli forces sentenced him to six months of administrative detention without charge or trial upon completion of his 14-year prison sentence. According to the ministry, the hunger striking prisoners have suspended their strike as they await a decision by Israeli authorities regarding Kayed’s detention. The ministry added that the Israel Prison Service (IPS) had returned 12 hunger-striking prisoners back to Israel’s Megiddo prison after transferring them to other prisons in Israel on Friday — a common tactic used by Israeli authorities to pressure Palestinian prisoners to end their hunger strikes. Ma’an News Agency further reports that IPS has transferred dozens of PFLP hunger-striking prisoners to various prisons across Israel since the start of the mass strike in an attempt separate them and disrupt organizing activities, and have placed others in solitary confinement. IPS also placed PFLP leaders Wael Jaghoub and Salah Ali in isolation on Friday “in an attempt to repress their growing protest steps and to neutralize the role of leaders and isolate them from the rest of the prisoners,” a statement by the PFLP said. As Kayed entered the 15th day of his hunger strike on Tuesday, IPS transferred him from solitary confinement at Ramon prison to solitary confinement at Ela prison in attempt to pressure him to end his strike. Israeli prison officers have carried out a variety of punitive measures against PFLP-affiliated prisoners who have joined the strike, such as raiding their cells, confiscating electronic devices, and shutting down water and cooling systems. 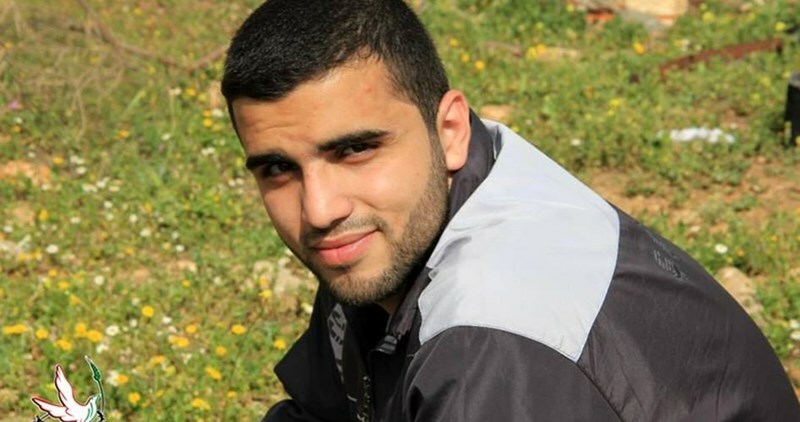 Kayed, a member of the PFLP, has been held in solitary confinement for more than a year after Israeli authorities learned of his leadership activities between Palestinians in Israeli prisons. The PFLP Prisoner Branch called the Israeli decision a “serious threat to all Palestinian prisoners that we must confront early before it becomes a systematic policy of the occupation,” in the statement published Friday. 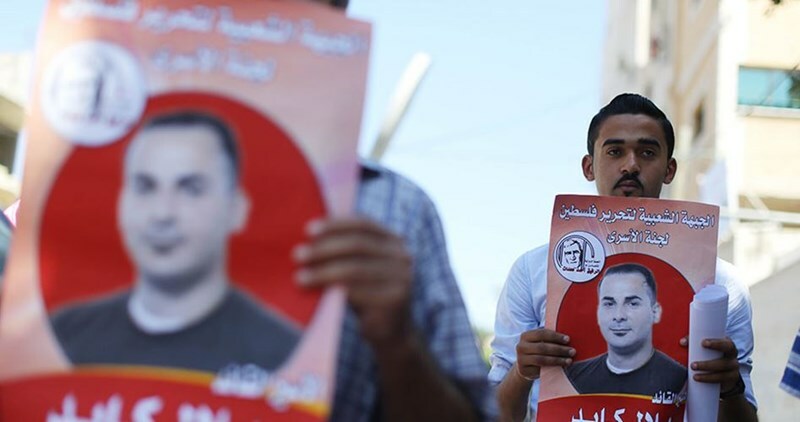 The statement said that the movement’s prison branch was initiating protest measures to continue throughout June and early July, to culminate in an open hunger strike by all PFLP-affiliated prisoners being held by Israel on July 7. Kayed was originally detained in 2001 for alleged involvement in the Abu Ali Mustafa Brigades — the armed wing of the PFLP. Rights groups have claimed that Israel’s administrative detention policy has been used as an attempt to disrupt Palestinian political processes, notably targeting Palestinian politicians, activists, and journalists, as it allows Israel to imprison Palestinians without disclosing evidence and without charge or trial. Israel considers the majority of Palestinian political parties to be “terrorist” organizations. As a result, most Palestinians who participate in the political arena in the occupied Palestinian territory risk being imprisoned by Israeli authorities. According to the prisoner’s rights group Addameer, there are currently 7,000 Palestinians held in Israeli prisons, 715 of whom are held under administrative detention. Israeli Occupation Authorities (IOA) have placed 65 Jerusalemite children under house arrest since the beginning of 2016 and held 12 others in administrative detention, rights sources revealed. The PA committee for prisoners and ex-prisoners pointed out that 18 Jerusalemite children were exiled from their towns during the first half of the current year. The committee considered Israeli systematic targeting of Palestinian children as flagrant violations of international laws and conventions. There are currently 440 Palestinian children in Israeli detention centers, while between 500 and 700 Palestinian children are prosecuted in Israel's military courts each year. Despite promises two years ago from the Israeli army to phase out night raids following international condemnation, in practice, they are used as routinely as ever. Some 60 percent of children were then transferred to prisons in Israel, in violation of international law, where, typically, they waited three months for their first family visit, as relatives struggled to get entry permits to Israel. Such abuses contrast strongly with the rights guaranteed to children both in Israel and in the Jewish settlements in the occupied territories. The Israeli occupation authorities (IOA) on Wednesday released lawyer Muhammad Alyan, the father of a slain Palestinian youth, on conditions of house confinement and a ban from al-Aqsa. According to a PIC journalist, the IOA sentenced lawyer Muhammad Alyan, the father of slain Bahaa Alyan, to a five-day house-confinement. An Israeli court in Occupied Jerusalem also slapped a 15-day-ban from al-Aqsa on Alyan. According to Alyan’s lawyer, his client was interrogated by Israeli investigators over his alleged involvement in an anti-occupation organization and his participation in a rally calling for releasing the bodies of slain Palestinians near al-Aqsa on Friday. The Israeli occupation army knocked down the family home of slain Bahaa Alyan in Jabal al-Mukbir, to the southeast of Occupied Jerusalem, in response to an anti-occupation shooting and stabbing attack he carried out on October 13 last year. The occupation authorities are still withholding the bodies of eight Palestinians killed by Israeli bullet fire, including Bahaa Alyan’s. On Tuesday, the Israeli Magistrate’s Court extended Alyan’s remand for another day pending further investigation. Lawyer Alyan was kidnapped by the Israeli occupation forces from his own family home in Jabal al-Mukbir on Monday. Israeli soldiers kidnapped, Wednesday, two Palestinian siblings from their home in the al-‘Eesawiyya town, in occupied Jerusalem. Media sources in Jerusalem said the soldiers kidnapped Ahmad Tarwa, and his brother Yazan, after storming their family’s home, and violently searching it. The kidnapped siblings were cuffed and blindfolded before the soldiers moved them to an interrogation facility in the city. In related news, Israeli navy ships opened fire on a number of Palestinian fishing boats, in Gaza territorial waters, in Beit Lahia, in the northern part of the coastal region. An Israeli court sentenced, Wednesday, a 14-year-old Palestinian child from Jerusalem to 100 days in prison, and a 2400 Israeli shekels fine, after he was held under house arrest for nine months. The Palestinian Prisoners Society (PPS) said the child has been identified as Fadi Shalloudi, 14, from the al-Bustan neighborhood in Silwan town, in Jerusalem. The child has been repeatedly detained by the army, in addition to his brothers, Samer, 17, and Bassel, 15, and their mother Shifa. In related news, the district court in Jerusalem ordered the release of a child, identified as Jihad Mohammad Shalabi, and forced him under house arrest for five days. 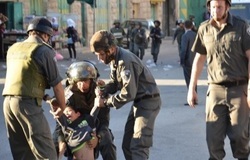 Israeli soldiers kidnapped the child, on Tuesday morning, from the courtyards on the Al-Aqsa Mosque. Issa Qaraqe’, the head of the Palestinian Detainees’ Committee, denounced the escalating Israeli violations against Palestinian children, and said that at least 65 children from Jerusalem have been detained, then forced under house arrest, since the beginning of this year. Qaraqe’ added that Israel is holding captive twelve Palestinian children under arbitrary Administrative Detention orders, without charges. 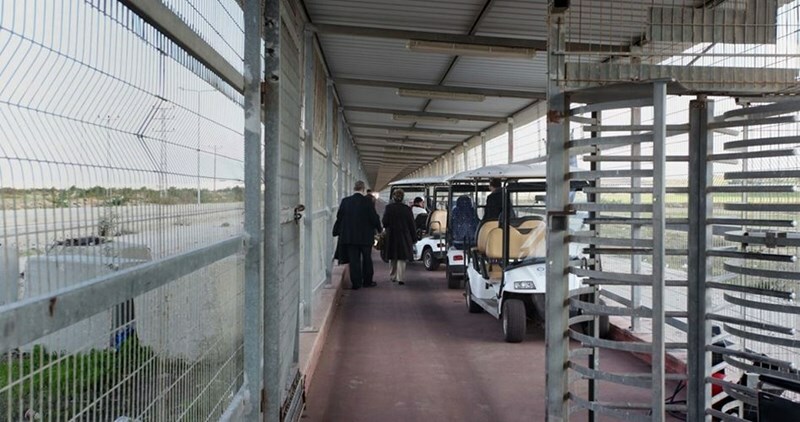 Mizan Center for Human Rights warned of the fact that Israeli occupation forces use the crossings for blackmailing and arresting sick people of Gaza Strip. Sick people are left deprived of accessing hospitals through Beit Hanoun crossing by refusing or stalling the issuance of passage permits. The Center pointed out in a statement on Tuesday that a sick citizen and two escorts of other patients were arrested at the crossing. The statement considered their arrest as violation of the international humanitarian law and paragraph 2 of article 38 of Fourth Geneva Convention which obliges Israeli authorities to provide citizens under occupation with medical treatment and health care at hospital. The Center also added that Israeli occupation violates human rights standards stipulated for in articles 22 and 25 of the Universal Declaration of Human Rights and article 12 of the international charter of the economic, social and cultural rights. 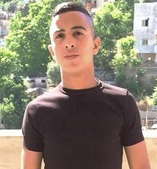 Palestinian Prisoner Society revealed on Tuesday that the Palestinian captive Akram Abu Taqatqa,18, from Bait Fujjar town near Bethlehem was subjected to abuse at the hands of Israeli soldiers during his arrest on June 22. The lawyer of the Society, Jacqueline Fararjeh, said after she paid a visit to the captive in Etzion jail that Israeli soldiers attacked him by severe beating and one of them extinguished his cigarette on his hand. Marks of torture are still obvious on the captive’s body, she pointed out. Israeli police forces arrested Tuesday one of al-Aqsa Mosque Mosque’s guards and took him to al-Qishleh detention center for investigation. 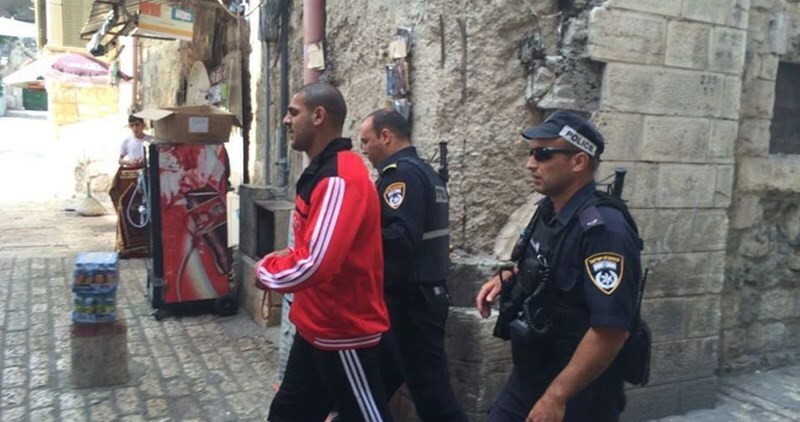 Local sources affirmed that Fadi Alyan, a guard at the holy shrine, was arrested today by Israeli police, bringing the overall number of Jerusalemite detainees over the past 24 hours to 17. 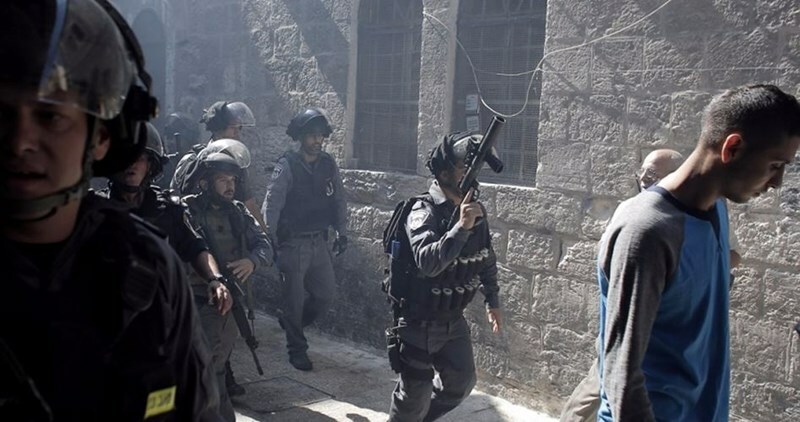 Earlier Tuesday, 12 Jerusalemite youths and minors were detained while leaving the Mosque. The Israeli Occupation Forces (IOF) arrested last night and Tuesday morning at least 18 Palestinians from occupied Jerusalem and West Bank. According to human rights sources, 11 Palestinian youths were rounded up once they left al-Aqsa Mosque in occupied Jerusalem. Israeli police also affirmed the arrest of 11 Jerusalemites for allegedly being involved in al-Aqsa clashes. Spokeswoman for the Israeli police pointed out that five more arrests were carried out overnight, bringing the overall number of Jerusalemite detainees along the past 24 hours to 16. Three other youths were arrested in Bethlehem, while two more detainees were rounded up in Ramallah and al-Bireh. A Palestinian youngster, from Tulkarem, was also arrested for entering lands within the Green Line without “Israeli permit”. On Tuesday morning, two arrests were reported in Ramallah, while Israeli forces violently stormed a number of houses in Nabi Salah village west of the city. All detainees were taken to unknown detention centers. The Israeli Occupation Authorities (IOA) released Tuesday the Jerusalemite activist Khadija Khweis under conditions after dropping all charges against her. The aim behind her arrest was to put more pressure on her as no charges or evidences were submitted against her, the lawyer clarified. According to the court’s release order, Khweis will be placed under house arrest for ten days and prevented from having access into al-Aqsa Mosque or the Old City for 60 days, in addition to paying a fine estimated at 2000 shekels. 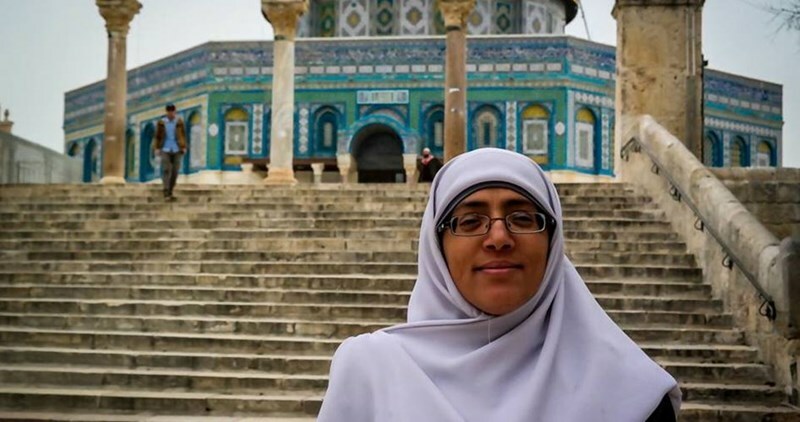 During Khweis’ detention, Israeli forces arrested her husband the academic Ibrahim Abu Alya and exiled him to the West Bank. Khweis was also denied entry to PA-controlled lands for 180 days. She was earlier arrested for four times under the same charge. Khweis’ sons were also detained and investigated for few hours before being released. Khwies is a mother of five children. She was subjected to systematic restrictions along the past years due to her defense of the Aqsa Mosque. The Factional Coordination Committee and the National Committee to Support the Prisoners called on the International Red Cross to work on ceasing the Israeli violations of Palestinian prisoners’ rights. 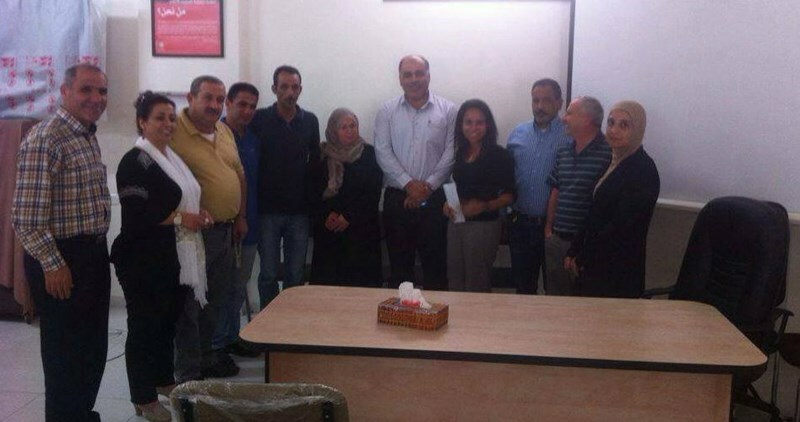 A memorandum on the situation of hunger-striking detainee Bilal al-Kayed was handed to a representative of the Red Cross during a meeting in Nablus. Prisoner Kayed was transferred to administrative detention in Israeli jails on the same day as he ended his 14-year sentence. The committees slammed the Israeli policy of administrative detention, without charge or trial, and such daily punishments as isolation, exhausting inter-prison transfers, and visit bans slapped against the Palestinian detainees, dubbing such tactics of torture crimes against humanity. Participants in the meeting called on the Red Cross to urgently step in and pay a visit to prisoner al-Kayed and other hunger-strikers in Israeli jails. The Israeli occupation authority (IOA) on Monday evening released Palestinian prisoner Muntaser ash-Shannar, a 25-year-old civil engineer from Nablus city, after he spent three months in jail, with no indictment. 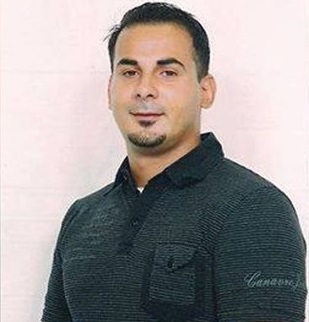 An Israeli court in Ofer military base had ended the administrative detention of Shannar and ordered his release last week, but the Shin Bet refused to comply with the verdict and extended his internment for another eight days. The Israeli occupation forces kidnapped Shannar along with his father from his home in Nablus city last April. His father, Mustafa, a professor at an-Najah University, was released two weeks after his detention. The engineer had previously been taken prisoner in the summer of 2014 and was prevented from attending the final exam before his graduation from the university. At the time, he was jailed for 14 months on a charge of his affiliation with the Islamic bloc, the student wing of Hamas, before his release in September 2015. The Israeli prison authority on Monday transferred Palestinian prisoner Bilal Kayed from Ramon jail to an isolation cell in Ella prison in Beersheba. The measure aims to pressure Kayed to break his open-ended hunger strike which he started about 12 days ago in protest at his administrative detention. 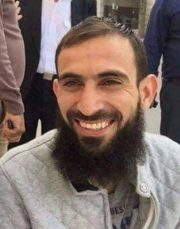 The prisoner was supposed to have been released on June 13, 2016 after he completed his 14-and-a-half-year prison term, but he was suddenly transferred to administrative detention. The Palestinian Detainees Committee has reported that a detainee, held by Israel since June 16, is ongoing with his hunger strike for the twelfth consecutive day, protesting torture during interrogation, insults and inhumane living conditions, in Asqalan Israeli prison. The committee said that the detainee, identified as Rif’at Jibreel Jamil Abu Fara, 29, has been subject to torture, in addition to very difficult, inhumane conditions, since his abduction. Lawyer Karim ‘Ajwa of the Detainees’ Committee stated that Abu Fara is only drinking water and that he is determined to continue his strike, especially after a military court ordered him under further interrogation. 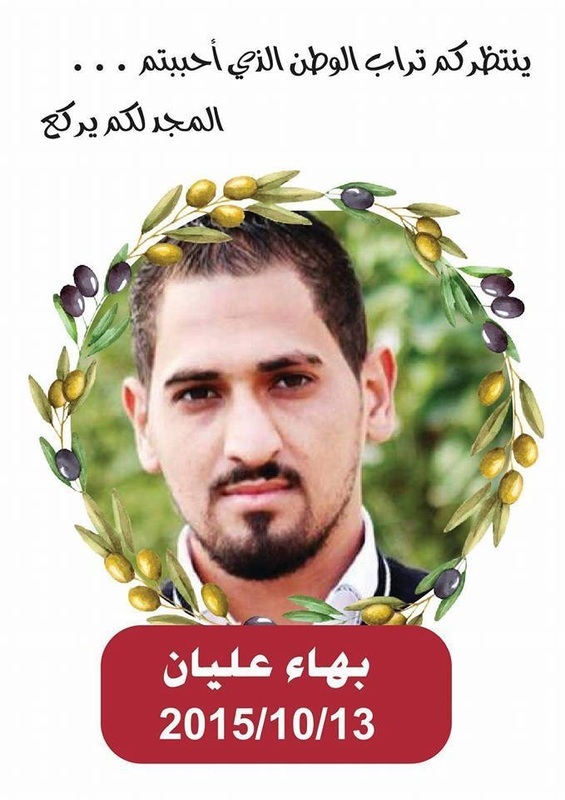 Abu Fara is from Surif town, north of the southern West Bank city of Hebron; his brothers Rafe’, 30, and Ala’, 22, were kidnapped by the army on June 7th. Israeli soldiers invaded, earlier on Tuesday, two towns in the southern West Bank district of Hebron, and injured many Palestinians during ensuing clashes. 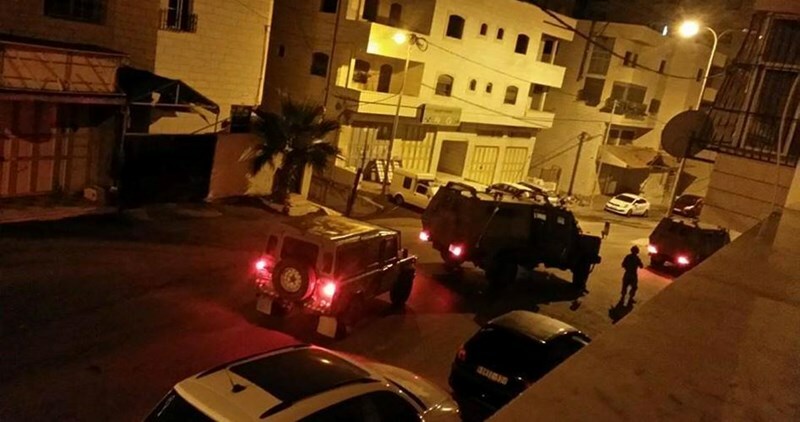 The soldiers also invaded Beit Fajjar town, south of Bethlehem, and kidnapped one Palestinian. Medical sources in Hebron said the soldiers invaded Shiokh and Sa’ir towns, north of Hebron, and clashed with many local youths, who hurled stones and empty bottles at the invading army vehicles. The soldiers fired several live rounds, in addition to rubber-coated steel bullets, and gas bombs, during the clashes that took place near the local clinic in Shiokh town, and Ras al-‘Aaroud area in Sa’ir. One Palestinian was shot with a live round in his leg, and dozens suffered the effects of tear gas inhalation. The soldiers also invaded Ras al-Joura, Ein Sarah, al-Kassara, ar-Rama, Jabal Johar, and the central Market, in Hebron city, and interrogated many Palestinians while inspecting their ID cards. In addition, the soldiers invaded Beit Fajjar town, south of Bethlehem, searched homes and kidnapped Rami Mohammad Abdul-Rahman Thawabta, 20, in addition to confiscating his car.